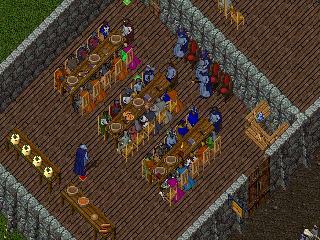 This is where I keep my personal memories of my travels in Ultima Online - maybe you will find some interesting things by reading it. 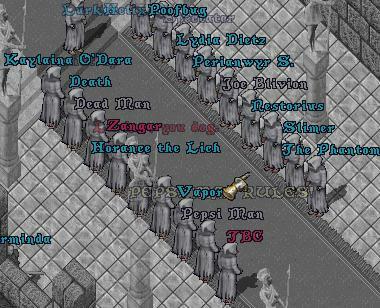 This photograph shows the End of the Ultima Online Beta Test. Demons were let loose in all towns of Britannia, this picture was taken in Britain. The Beta Test had been going on for some months and overall was successful. Many voice said that the beta test should have been extended because lots of bugs remained. But it also made the way fre to really start developing a character without fear to loose it again at the next armageddon, also called "character wipe". Imagine my joy, when I killed my first real monster with my own hands! 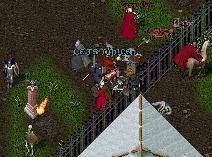 This was at the orc fortress near Cove. Yes, I still weared chain and an orc helmet then :) Since these days I have enjoyed engaging new monsters. I remember well when I stood in awe before a reaper, because I remembered them as very tough and vile with magic from my times as Avatar in earlier Ultimas. Then I boldly charged the tree and fell it together with a passer-by and yes, it was a great sight! The feeling of power came when I learned the arcane arts and was able to weave the magic of the 4th circle. Dozens of monsters fell to the deadly fire fields and even now, when the power of the spell weakened, its still a great sight to see corpsers burning. This was a spooky event... Lots of ghosts gathered at Lord British's castle to haunt the town of Britain and the castle grounds. Several group photographs were taken. After the event everyone gathered at the Britain healer and started to fight the healers, guards and each another after the street was littered with bodies. Christmas 97 Santa Claus appeared in Britannia. No, not only one but hundreds of them. They offered a bag of goodies to the honorable people and a bag of useless junk (what I have heard) to the bad guys. More than once did I see one stripped of all clothes! The gifts were nice.. some pizza and champagne, a wrist watch and a fireworks wand. 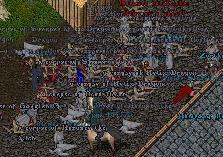 On the morning of January 31th, Central European time, a call to arms was yelled at Vesper town square before the bank. Morgan Blacktop told about a Madman at the graveyard threatening to level the town of Vesper. 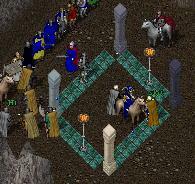 Many a hero followed the call and hurried to the graveyard to be greeted by a horde of skeltal knights, bone knights and bone magi, led by a mysterious mage character called Kwin Li, Lord of the Mists. The mage was quickly disposed by a shower of fireballs and other magery soon after I arrived at the scene. Skeletons and bones still hunted the graveyard for some time afterwards, being hard to hit. The skeleton knights were said to wear plate armour. Overall it was a nice distraction from the routine at a time probably more suited for European players. Magnus Lee: Mayest I have a word with thee, Sir Gargish? Gargish Dragon: What is your concern? Magnus Lee: Art thou adept at inscribing? Magnus Lee: Dost thou have a scroll of call lightning? Magnus Lee: Mayest I purchase it from thee? Gargish Dragon: Sure.. lets say 50 gold? This conference was held in the Old Winery Convention Center near Empath Abbey. The Seekers of the Wisps presented their theories on the nature of Wisps and the world, Britannia. The conference ended in Chaos, as an agent of a strange organization, the VOID threatened members of the Seekers and other participants. I have made a transcript of the conference. Lord Keuldan Vraal approached me on a matter he thought might need my expertise as an expert of Gargish. He showed me three books written in a strange language, which I found out, was not Gargish. On the illustraion you can see one page written in that strange language. If you know how to translate it, contact me. The books seem to indicate a connection between demons and wisps, and among the words which could be understanded were the names of Nosfentor, known from legends as a Shadowlord, and Mondain, the evil wizard. Additional note, 8-Apr-2000: After such a long time I think releasing the information might be more helpful than dangerous, so have a look at the books by yourself and judge. An earthquake shattered the mountain range north of Britain, and in the process, the earth split open. See the illustration showing the resulting lava pit. Mellin the mage guildmaster found crystals in the pit which were examined in Britain. 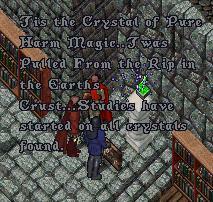 One of the crystals, the Crystal of Harm, was displayed in the mage guild in Britain. You know what? Magery is hard work. Few did I know of magic when I woke in this world. Slowly I began to understand the workings and secrets of the magic trade. Summoning daemons is considered one of the most difficult incantations of magic. You probably can understand my feelings when I was finally able to summon my first daemon and have it follow me around. If you don't know yet, daemons make powerful allies when fighting against mean creatures. I have found them to be good partners fighting against liches, for example. Daemons have powerful spellcasting abilites. Too bad that the Britannian population tends to disrespect daemon summoning and I fear mages who follow the art of daemon summoning will be outlawed soon. I have heard rumours that Daemons might have inhabited Britannia for much longer than humans. It seems daemons are very intelligent creatures. 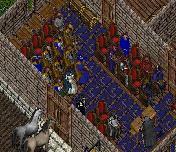 This picture shows the second dragon meeting in the UDIC hall in Rivendell. 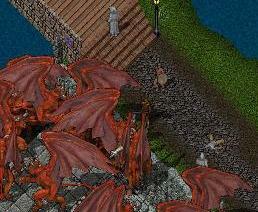 Daedric Dragon had invited all Ultima Dragons and some of their friends to this meeting. Its main focus was on roleplaying. 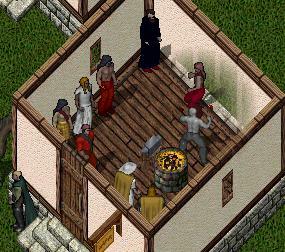 There are several guilds in Britannia which emphasize roleplaying. Present where the Knights and Merchants of Rivendell, many of which are Dragons, and Octal Dragon with the Sunset Knights. Other guilds trying to improve ropleplaying are the Lost Order of Akalabet, the Tiger Knights Battallion, the Seekers of the Wisps, and the Order of the Ebon Skull. Tis strange thing happened to me recently. The town criers were telling of a strange temple which should be located in a cove in the mountains north of Britain. After talking to two friends from the honorable Sunset Knights we headed north out of the town of Britain, along the graveyard until we reached the mountains. Sadly, we got separated soon and I was trying to find the place the crier hat spoken of. I worked my way from the western parts of Serpents Spine mountains along and past the small pass leading to the dungeon known as Despise. Soon after going another short distance along the mountain range I was greeted by a band of unfriendly orcs which were soon no more. A small entrance into the mountains was nearby and I already heard battlecries coming from the pass. Quickly I readied my spellbook and awaited the worst as I proceeded inside the mountains. I was greeted by some evil looking black archmages and a great number of heroes fighting these. In the middle of the place marking the dead end of the pass stood what looked like a small temple. There were four pillars in different shades of grey, two braziers and the most amazing sight, a green object looking like a skull that was yelling strange words. I think I heard the phrase "Thy fate has been tested". Strange words were inscribed on the pillars and as I listened, I heard several people of the crowd chanting them. If I remember right, it were the words "MAL GU OM VARKA TALMA". I soon had to find out the effect of those words as an uncountable number of undead creatures appeared inside the temple. Luckily these were quickly dealt with by the crowd which seemed to enjoy the ongoing slaughter. The crowd had no time to recover as soon another wave of lzardmen appeared charging everyone in sight. As warrior veterans know, those lizards dont present much of a challenge, so the floor was soon littered with the corpses of the dead, when suddenly huge heaps of gold coins were drawing the attention of everyone. 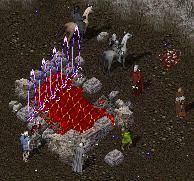 This seemed a deadly trap as just when everybody was grabbing for the gold a ring of blood elementals appeared. If you ever fought one of those creatures residing in the deepest caves of the dungeon Shame you know what that meant. Many a warrior found his death. As my reagent supply was quickly used up, I had to retreat after two of these beasts came chasing after me. When I finally got back to the fight, I found the place empty with just an inscription telling that the place might come to life again when the braziers are alight. When this will happen no one knows. The temple, named Temple of Fate still stands and may be visited by the curious traveller. Helgi Einarsen announced the formation of the Yew Town Council of Justice . I attended all of the meetings. You can read the transcript of the first meeting and the transcript of the second meeting . On the first meeting, I was voted preliminary Secretary of the Council. Did you ever wonder about the islands on the deepest level of the dungeon Shame? I did, and decided to explore the islands. My first expedition was by boat. 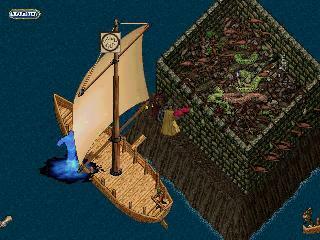 I launched a ship on the large lake in the fifth level. There are five islands. 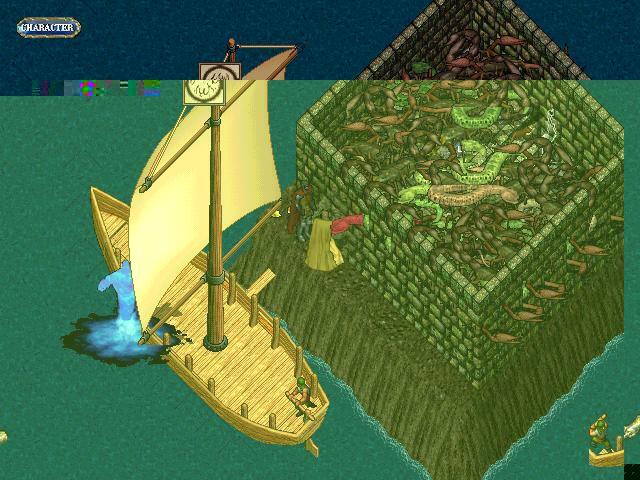 Four of them are just bare open space with an occasional rat, slime, scorpion or giant snake on it. The fifth is more interesting. It is completely walled in with only a small ledge outside to stand on. I puzzled how to get inside the walled area, as there were two chests and several glowing runes inside the chamber. My second expedition was well prepared. I fought for about two hours until I finally made it inside the room. I don't want to spoil your fun trying yourself, so if you want to know how I finally succeeded, ask me and I will tell you how to do it! I am a Master Mage. That alone is responsible that I have build quite a proficiency in weaponless combat, as mages often have to fight bare handed when the casting of a spell fails and the opponent closes in. Well, I followed the call to a Wrestling Match held near Britain. Even if I couldn't stand against professional wrestlers with incredible strength, I won the fight against my first opponent and the second was nearly a draw. Nevertheless it was fun. Recently I became restless again and went into Shame to fight the most deadly of opponents found there, blood and poison elementals. You have to be a powerful mage and be quick if you want to succeed against them, as they cast deadly magic which can kill you in seconds and the poison elementals possess deadly poison which you wont survive for long. Combined forces gathered at a supposedly secret meeting place of the organization which calls itself "The Movement". Concealed, they waited until five members appeared and gathered around a sacrifical altar, on which were placed the bones of a victim. Right into the discussion, one of their members was alerted of the presence of us, and a short but fierce battle started. Two of their members were killed, three fled the scene. Who are the members of this sect and how were they discovered? 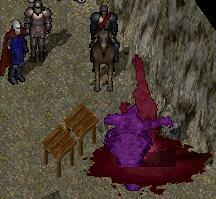 Last week, at the Grand Bazaar held in Trinic, a merchant was murdered. A quickly organized search party was able to track the murderers to a house near the Shrine of Spirituality. While the murderers were not found, the house was identified as the house of Quanta, blacksmith. In the days to come, several private investigators collected information by talking to local residents and found evidence by searching the houses of several of what appeared to be a whole group. As investigations proceeded, it was found that there was indeed an organization which called themself "The Movement". A document called "The Code" was discovered. The document contains eight commandments. Those commandments seem to be related to the Eight Virtues. They enforce severe punishment in case one of the Virtues is not followed. This must be the reason why the merchant in Trinsic had to die and why one of their members was found dead in the city of Moonglow. There was also evidence of the organization acquiring great numbers of arms and armour for an unknown reason. It seems that this "Movement" was a threat to our society. It was time for a strike. Since the organization left information about a meeting, this was the opportunity to have them all in one place and destroy their group. The five members who appeared at the gathering were Sir Valadarzim, Quanta, Gorath'al Tarnis, Roderique and Alexis, their spiritual leader. While Quanta and Gorath'al fell in the battle, Valadarzim, Roderique and Alexis got away. They may be a threat in the future, but for now the organization is weakened considerably. A journal by Alexis showed that there must be some immortal entity guiding the "Movement". This entity probably dictated the "Code". There is more than just some religios fanatics trying to "better" the world. If they can attract followers to their radical application of the Virtues this entity may gain great influence in Britannia. We must be on guard for new attempts to establish these ideas in our society. A good account of all that happened can be found on Garulfo's pages about the "Movement" .